The journey to Greenland is not easy. There are no direct flights from the U.S. and the layovers in either Denmark or Iceland are long. Those that make the journey will be overwhelmed with its beauty. Ilulissat, Greenland is noted for its incredible icebergs. The size and amount of icebergs relate to what is happening with our climate. Kirsty and I checked into the Hotel Arctic where we had a spectacular room overlooking the icebergs of Disko Bay. I walked to town to talk about my night flight over the Jakobshavn and Northern Glaciers with Ricky Nielsen of Air Zafari. Greenland Telecommunications had leased all of the Air Greenland helicopters for the week. Tonight’s aerials would have to be done in a twin-engine Vulcan, where the slowest speed would be 90 mph. From 8 to 11:00 PM we flew over the Jakobshavn and Northern Glaciers, Greenland’s ice sheet and Disko Bay. A great beginning to what will be an amazing 11 days in Greenland! The Jakobshavn Glacier is the fastest receding glacier in the world and therefore is constantly calving. The icebergs from this glacier fill the Jakobshavn Inlet in Ilulissat. The Jakobshavn inlet looks like it consists of floating pieces of ice, but these are actually thousands of icebergs that calved from the Jakobshavn Glacier. Only 10% of an iceberg is seen above water. 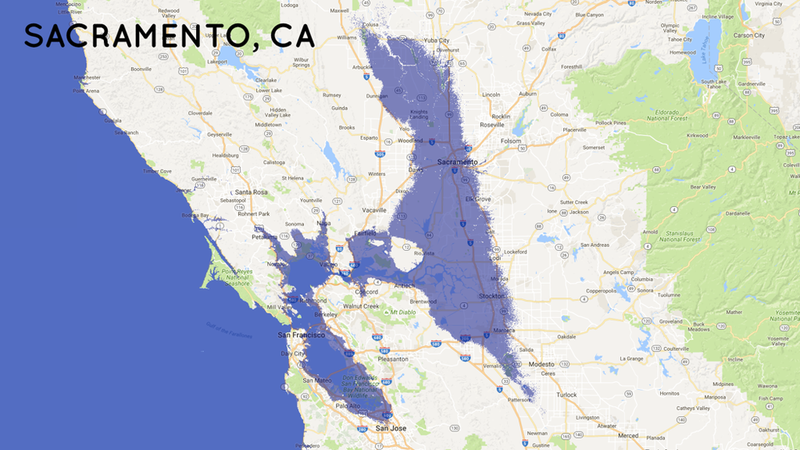 The remaining 90% is underneath the water. These icebergs move rapidly and eventually spill out into Disko Bay. It is believed that the iceberg that brought down the Titanic came from this glacier. According to University of Washington glaciologist, Ian Joughin, The end of every summer for the last several years has seen Jakobshavn’s calving front move 600 meters (2,000 feet) farther inland than the summer before. The Northern Glacier, located adjacent to the Jakobshavn, is quite dormant and moves very little. Glacier melt is evident everywhere. We then continued our flight over the Labrador Sea to view the icebergs from above. At 10:00 AM we boarded Water Taxi with Anders to go to the Eqi Glacier, where we would watch and listen to its constant calving. Traveling amongst the icebergs in the Labrador Sea for 10 hours was magical. The temperature in Ilulissat varied between 55-65F degrees. On my last trip to Ilulissat in August of 2007, the temperature was 20F degrees. 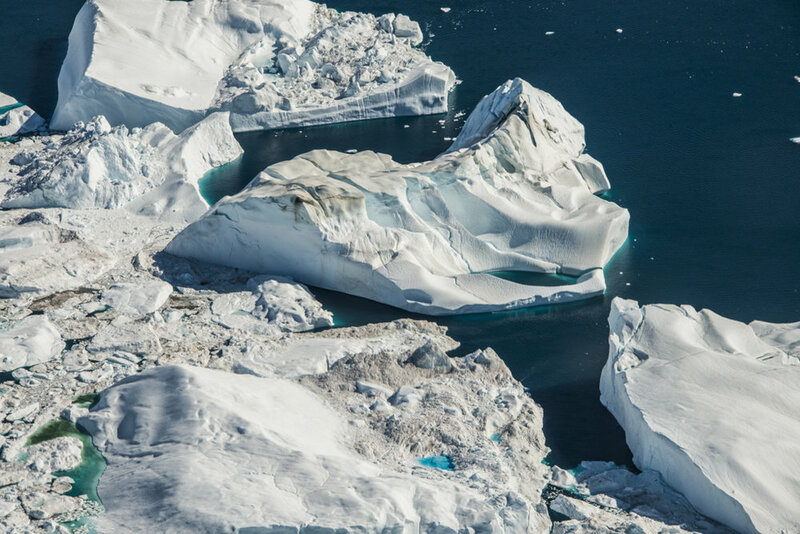 According to University of Delaware Professor, Andreas Muenchow, Temperatures in Greenland are rising five times faster than the average global temperature. There is nothing more beautiful than watching the sun lower over the icebergs of Disco Bay. With twenty-four hours of daylight, Kirsty and I could begin our hike over the rocks at 10:30 PM in order to photograph the icebergs in Disko Bay. The icebergs turned orange and pink in front of our eyes! On my last trip to Disko Bay in 2007, there were fewer icebergs but they were much larger… another reminder of climate change. Kirsty and I began editing our photos and waited to hear if we could obtain a helicopter today. Greenland Telecommunications would need the helicopter one more day but we were promised that we would be able to charter the helicopter tomorrow morning. Evening becomes a photographer’s dream when the sun travels around the horizon and light is constantly changing. Tonight we would travel through the icebergs of Disco Bay with Andreas and Johan from Ice Cap Tours. A magical kingdom of icebergs in different shapes and textures surrounded us. Waterfalls fell from the tops of the structures. Humpback whales surfaced before our eyes while Fulmars flew, dove and basked in the pristine waters. We woke up early for our last Ilulissat experience. From 9:00 AM until 12:00 PM, we flew in Air Greenland’s AStar 350 helicopter over Greenland’s ice sheet which was studded with pockets of crystal blue melt water lakes and rivers. Memories of my last AStar helicopter experience in the same area in 2007 convinced me that Greenland’s ice sheet was melting faster than I had expected. Streams flowing with water emptied into many more ponds and lakes. The snow contained much more silt and was no longer pristine white. Kirsty flew back to NYC through Iceland, and I flew to Kangerlussuaq to meet the Tällberg Foundation group where would begin our East Greenland Ice Core Project (EGRIP) excursion. The Tällberg Foundation encourages global conversation about issues that are critical to the evolution of our societies. A key focus is climate change and its impact on the planet. 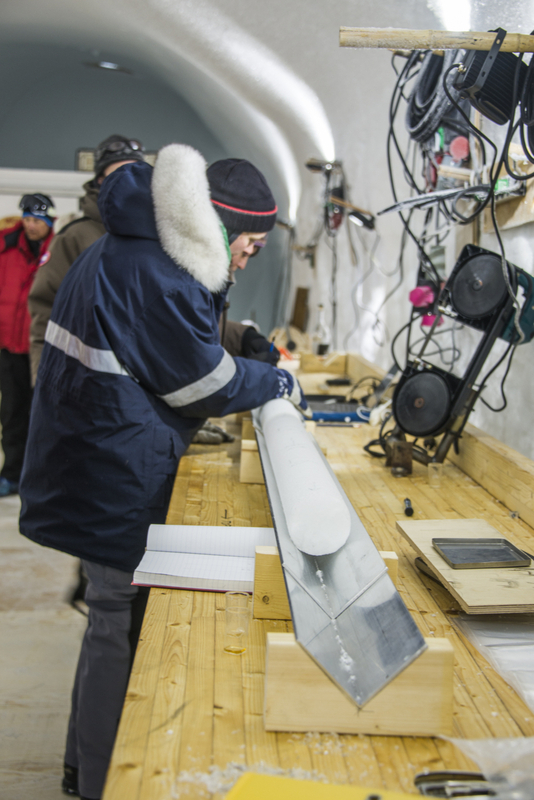 The Tällberg Foundation was invited to organize a seven-member delegation that would witness the drilling of ice cores at the East Greenland Ice Core Project (EGRIP). The intention was to bring laymen to the site who would communicate to the public the importance of analyzing ice cores from the past 100,000 years. Ice cores are physical records of the effect that atmospheric gasses have had on temperature and sea level rise throughout geological time. With this data, scientists can predict the Earth’s future climate. After dropping our bags at Hotel Kangerlussuaq, Sune, the field manager at EGRIP gave us an in depth tour of the Kangerlussuaq area. Kangerlussuaq is located south east of Ilulissat, and was a US military base until 1992. We watched the gushing run-off from the Russell Glacier under the Watson River Bridge, which had been washed away during the unprecedented surface melting of Greenland’s ice sheet in July of 2012. The melt was in far in excess of any earlier year in the satellite record since 1979. During a four-day period in July, nearly 97% of Greenland’s surface ice sheet had thawed. Today, the temperature in Kangerlussuaq was a record 72 F degrees. After collecting our cold weather gear for our trip to the ice sheet, we had a briefing and had dinner at Lake Ferguson’s Roclub, where we tried local Schnapps and Musk Ox. We woke up early to board the LC-130 Hercules for our 2 ½ hour flight to camp EGRIP. 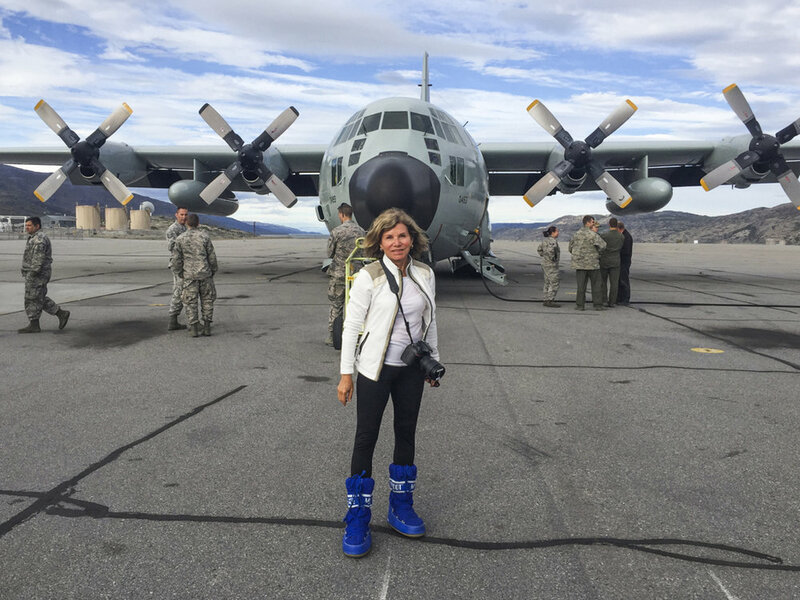 The Hercules is equipped with skis, which enable the US National Guard to land on Greenland’s ice sheet. There were 27 of us on this flight including Bill Nye (The Science Guy) with a documentary film crew of four. Also present was Jim White (Director of the Institute of Arctic and Alpine Research at the University of Colorado), and a small Chinese Delegation that would observe the EGRIP station for two hours before returning to Kangerlussuaq. 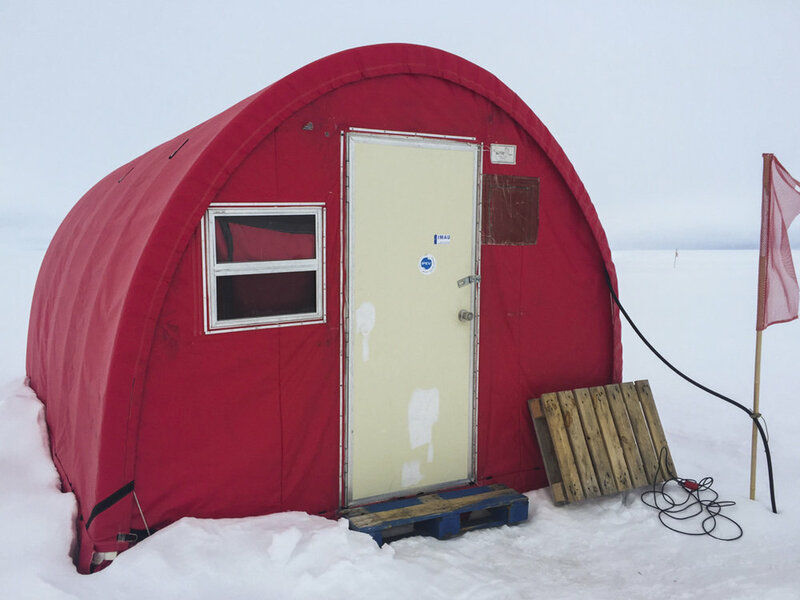 We arrived at EGRIP at 12:30 to find that we needed our moon boots and cold weather gear since the temperature was 11 degrees F.
The East Greenland Ice Core Project (EGRIP) is located over the Northeast Greenland Ice Stream (NEGIS). 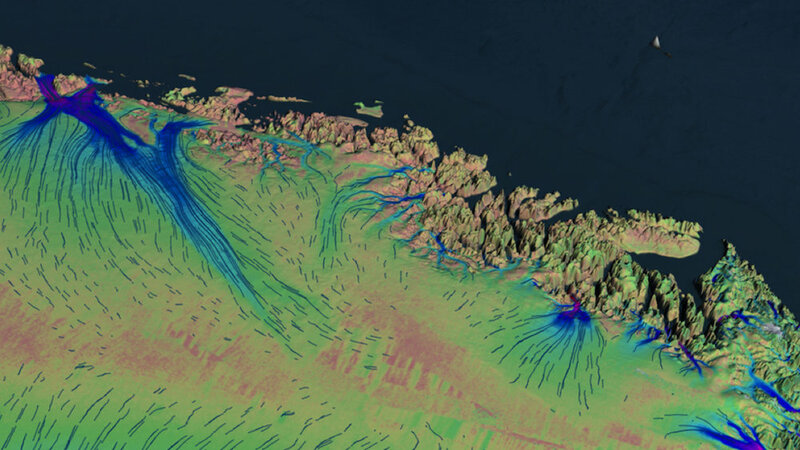 The NEGIS flows at a rate of 60 meters per year and empties into the Nordic Sea in 3 different locations. There are several streams under Greenland’s ice sheet. Each one flows at a different rate and contributes to the rise in sea level. We were greeted Dorthe Dahl-Jensen, Chair of the EGRIP project. Dorthe is a paleoclimatology professor and researcher at Centre for Ice and Climate at the University of Copenhagen. Her team reconstructs climate records from ice cores and boreholes that extend back as far as 100,000 years. While drinking coffee and homemade cinnamon buns in the “Dome”, Dorthe gave us a briefing about EGRIP and the importance of gathering data from the ice cores that will be drilled there. After dropping our duffels into our respective tents, we watched the Chinese delegation return to Kangerlussuaq on the LC-130. The camp at EGRIP consists of a large black dome, seven red sleeping tents, several maintenance tents and the drill pit. All our communal activities occur in the dome. 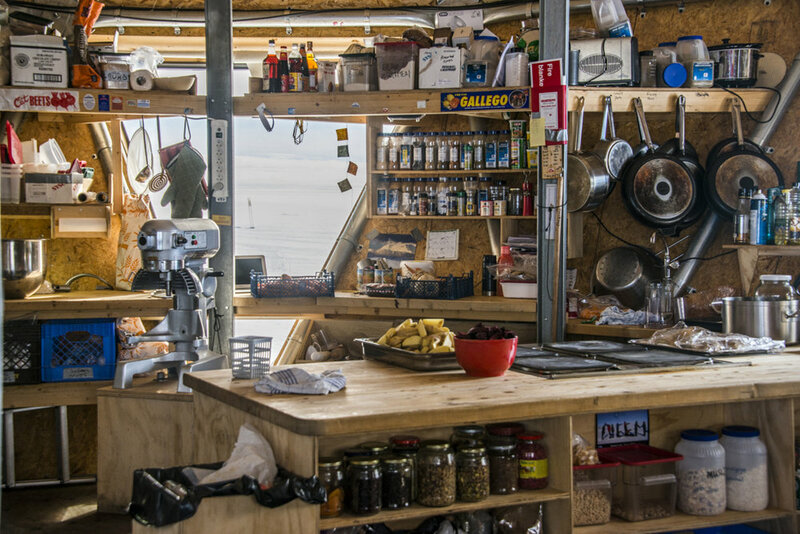 There is a kitchen, dining, lounge, one shower, two sinks, two toilets, plus a washer and dryer for the whole camp. The main attraction is the drill pit where most activities occur. This facility consists of several rooms that are constructed by placing large balloons in hand-dug underground pits. Two meters of snow are then blown with a piston bully over the openings, creating a roof. The longest room houses the drill, tables to place the ice cores, and equipment that will analyze the cores. This room houses a 14-meter deep pit where the drill will be lowered and drilled into Greenland’s ice sheet. Another room will act as a storage facility for the cores. Each one will be placed on individual troughs that have been labeled according to the depth of the core. EGRIP will drill down to the bedrock, 2600 meters below the surface of the ice. The cores that are between 600-1200 meters deep will be stored for one year. The pressure on the air bubbles in the ice at this depth makes the ice quite brittle, and these cores will need to rest before they can be analyzed. After a delicious dinner prepared by Josephine, the amazing chef at EGRIP, we watched the movie Camp Century. During the 1950’s Cold War, the United States wanted to increase its military capabilities against the Soviet Union in case of nuclear warfare. Military operations in the Arctic and Subarctic would give the United States the shortest route to strike targets in the Soviet Union. Project Iceworm was the code name for the US Army program titled “Camp Century”. 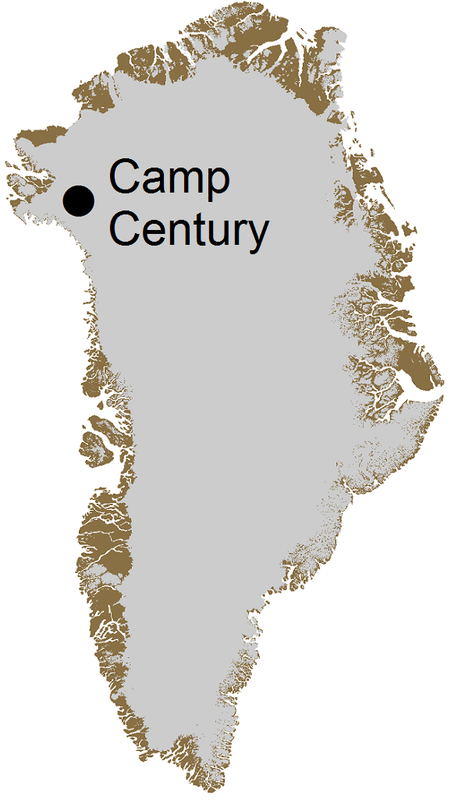 The location of Camp Century in Greenland. The proposal was for the United States to build a network of nuclear missile launch sites under the Greenland ice sheet undetected by the Soviet Union. The Danish Government was informed that the purpose of Camp Century was to test various construction techniques under Arctic conditions. Trenches were cut and covered with arched roofs and prefabricated buildings were placed inside these trenches, including a hospital, shop, theater and a church. Electricity was supplied by the world’s first portable nuclear reactor, and water was supplied by melting glaciers. 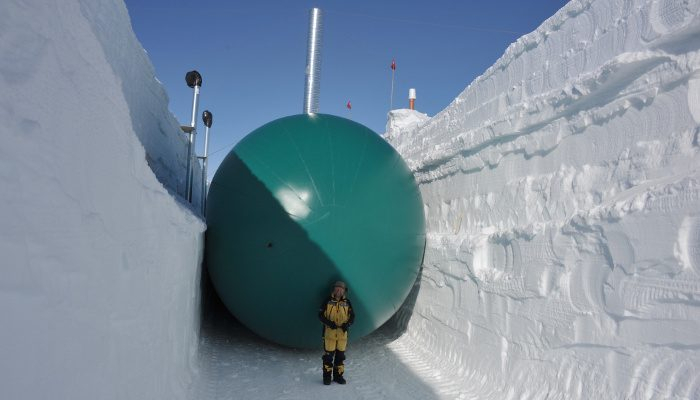 Geologists took ice core samples within three years of excavation. These samples demonstrated that the glacial ice sheet was moving much faster than was anticipated, which would result in a collapse of the tunnels. Camp Century would never become a nuclear missile base but the information on Arctic construction techniques and Arctic living was invaluable to climatologists in pursuing ice core drilling. The group was both excited and exhausted from this stimulating day. Before crawling into my mummy sleeping bag, I took one last photo. After breakfast, Jim White (Director of the Institute of Arctic and Alpine Research at the University of Colorado) gave a presentation about the need to educate the public on the causes and effects of climate change. Most of these climate changes will not affect our generation, but we need to think about future generations. Climate change will affect our water supply, our use of land and our politics. Our grandchildren will live in a very different world. Climate change is not a debatable subject. Climate change is happening and it is happening abruptly – this is a fact. The debate has been whyclimate change is happening. Is it man-made, or just an evolutionary cycle? Ice cores can reconstruct climate records through isotope analysis. By analyzing the atmospheric conditions in ice core data, scientists can predict future climates with similar conditions. Recrystallized inclusions within the ice are a record of proxies for wind blown dust, ash, pollen, atmospheric gas bubbles, radioactive substances, ocean volume and local temperature. This chart is a record of the different glacial and interglacial periods for the past 800,000 years. In this chart, the blue is a glacial period and the yellow is interglacial. We are now in an interglacial period. The numbers on the left side of this chart indicate the parts/per million of CO2 in the atmosphere. In this 800,000 year-timeframe, the atmospheric C02 level has not been above 280 parts/million. Peak global mean temperature, atmospheric CO2, maximum global mean sea level (GMSL), and source(s) of meltwater. Light blue shading indicates uncertainty of GMSL maximum. Red pie charts over Greenland and Antarctica denote fraction (not location) of ice retreat. Today our CO2 level is at 405 parts/million. 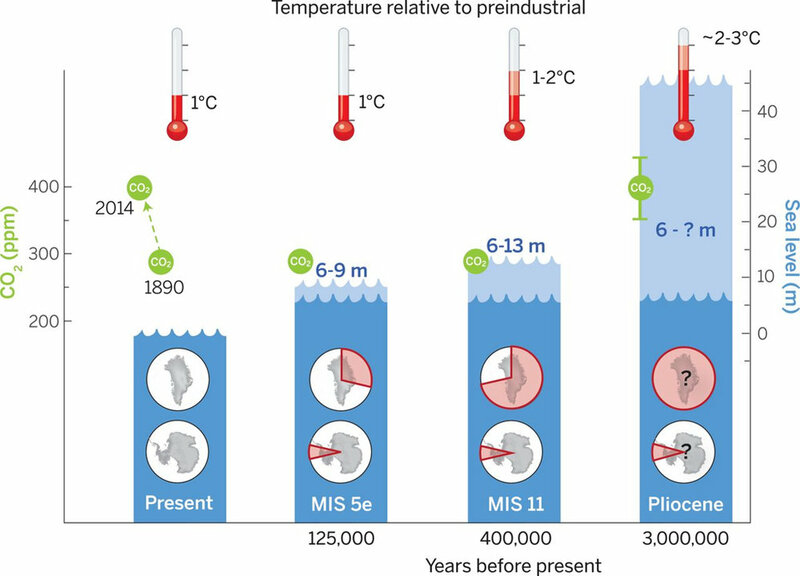 The last time the CO2 level was 400 parts/million was during the Pliocene Epoch, 3,000,000 years ago. At that time the temperature was 2-3 degrees C warmer, and the sea level 2-13 meters higher. Reef corals suffered a major extinction while forests grew up to the northern edge of the Arctic Ocean, a region that is now bare tundra. This graph illustrates how the tropospheric (our lower atmosphere) greenhouse gas concentrations have changed during our interglacial period. Please note the abrupt increase in greenhouse gasses since 1750 (the industrial revolution). Life on earth as we know it depends on the existence of Greenhouse gasses, which keep the earth warm by absorbing and emitting infrared radiation. Currently, the Earth’s average surface temperature is 59 degrees F. Without Greenhouse gasses, it would be 0 degrees F. Our greenhouse gasses consist of Water Vapor, Carbon Dioxide, Nitrous Oxide, Methane, and Ozone. The contribution of each gas to the greenhouse effect is affected by the characteristics of that gas, its abundance, and any indirect effects it may cause. The atmospheric increase in CO2 allows for more heat to be absorbed into the Earth’s atmosphere. Methane is one of the strongest greenhouse gasses and has 29 times the impact on temperature than CO2. Thirty–three percent of human methane emissions are due to the production, distribution and combustion of fossil fuels. Twenty-seven percent of methane emissions are due to the release of methane as a by-product of digestion that is exhaled or released via flatus by ruminant animals such as cows, sheep, and goats. The largest source of Nitrous Oxide is from the use of synthetic fertilizers in agriculture. 71% of the Earth’s surface is water. The long-term effect of a warmer atmosphere is a warmer ocean. It will take many more years for the ocean to cool than the atmosphere to cool. An increase in temperature of the ocean will result in an increase in water vapor, which will also contribute to the greenhouse effect. When water warms, it expands. Thermal expansion will contribute to 33% of the rise in the level of the ocean. The other 66% of sea level rise will be due to the melting of Greenland’s ice sheet and the melting of mountain glaciers. Jim’s presentation stimulated a lively dialogue that extended more than an hour. 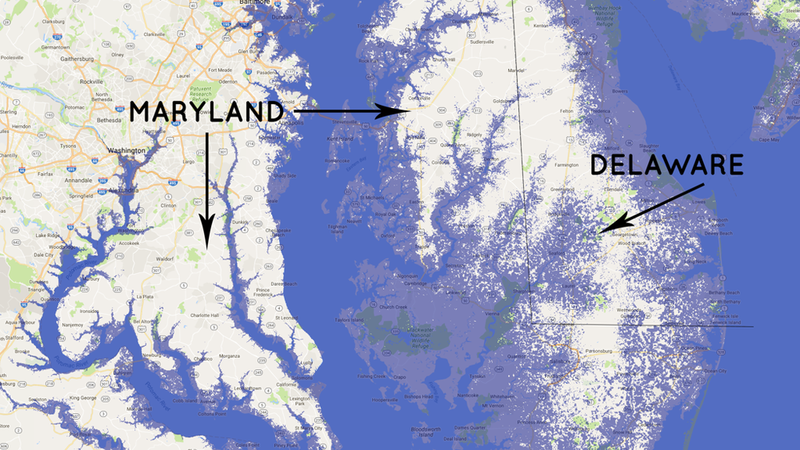 What will happen with the population that will be displaced when our oceans rise and the Earth’s low-lying areas are flooded? 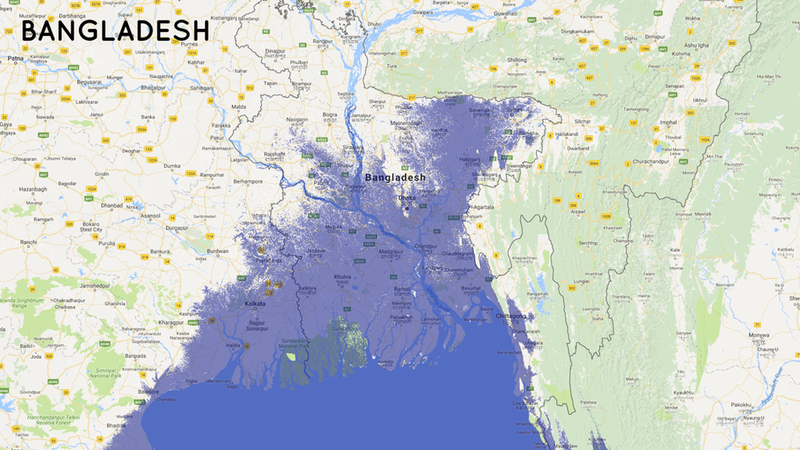 According to Climate Central estimates, more than 150 million people are currently living on land that will either be submerged or exposed to chronic flooding by 2100. Our world population has doubled since 1970. How will we have enough food, energy and land to accommodate this growth? To control this, we must empower women politically and economically. Bill Nye was our optimistic voice. d) Liquid hydrogen-fueled jet planes. After lunch, we went to a snow sampling room. In this room, Diane Vladimirova from the Alfred Wegener Institute (AWI) and Martin Madsen from the University of Copenhagen take samples and analyze this untouched snow for pollutants and gasses. This surface snow can measure high and low pressure changes and shifts in humidity. Diane and Martin had created a ditch to look at the layers of snow, which were illuminated by the outside light. By analyzing these layers, they can determine the moisture in the snow during the past four years. Evidence of Greenland's Ice Sheet Melt in 2012. Another beautiful morning at EGRIP. Today, Trevor Popp (Associate Professor at the University of Copenhagen) gave us a more in-depth lecture on the mechanics of ice core drilling. The ice core drill is placed above the pit and is lowered by a cabling system. Its movements are controlled through instruments located next to the cable. The first drilling proceeds until the drill reaches 300-400 meters below the surface, which will take approximately 3-4 weeks. Each ice core extraction measures 3.5 meters long with a diameter of 10.16 cm. When the drill reaches 300 feet, the pressure of the ice will cause the hole to deform. Estisol-140 will be poured into the drill hole to prevent it from closing, and the drill will be lowered into the filled hole until it reaches the bedrock, 2550 meters below. It will take three to four field seasons (summers) to reach the bedrock and 2 hours to extract the final ice core. All of the ice cores are labeled and placed in a cold auxiliary room for storage until they can be shipped to Copenhagen for further analysis. We all proceeded to the drill pit where we would witness the first ice core being drilled at EGRIP. Shots of Cognac were passed and we all toasted this initial drilling! After lunch, Dorthe gave us a lecture on the Greenland ice sheet. The largest ice stream in Greenland, the North-East Greenland Ice Stream (NEGIS), begins at the central divide and cuts through the ice sheet in a wedge shape. It divides into 3 smaller streams that empty into the Nordic Sea. 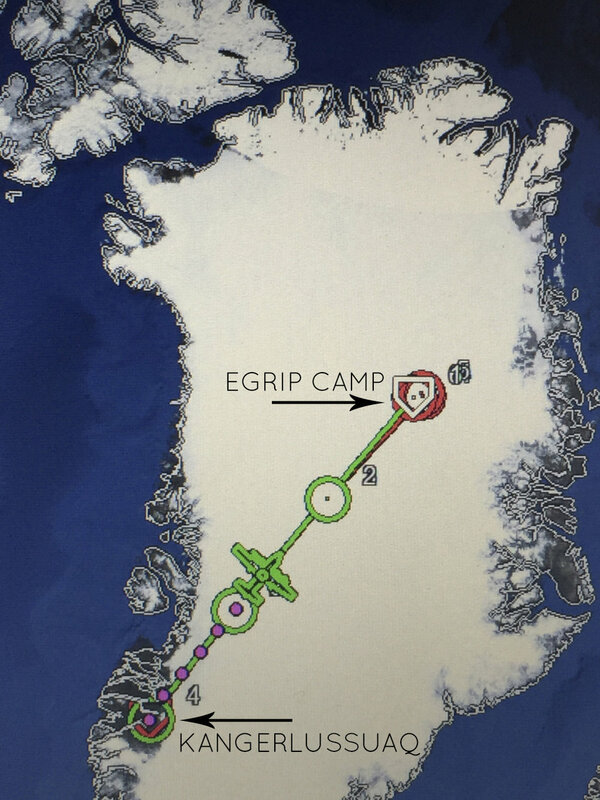 Through radar detection, EGRIP was able to locate its camp directly above NEGIS. The East Greenland Ice Core Project’s goal is to gain new information on ice stream dynamics in order to understand how ice streams will contribute to future sea-level change. Ice streams discharge icebergs into the ocean, which accounts for one half of the mass lost from Greenland’s ice sheet. These streams are formed by the melt at the base of the ice sheet and reach velocities of 100 meters/year at 200 kilometers from the divide. They have doubled their velocity during the past decade. Today, the NEGIS flows at 60 meters/year. Will there be a change in velocity when this project terminates in four years? We anxiously await the results of Dorthe’s research. NASA scientists use satellite imagery that illustrates the movement of the ice streams from the interior toward the outlet glaciers. The NEGIS flow is illustrated above. The blue and purple are the fastest moving ice, and the yellow and pink are the slowest. Gathering in the Dome for a delicious dinner with peach cobbler for dessert and a few glasses of wine along with stimulating conversation was a great way to end this day. After breakfast, Pierre Cousteau and I took a snowmobile out into one of many untouched areas of the ice sheet. The expanse of unlimited ice and sky is an awesome experience. It makes one feel humbled by the force of nature. Perhaps this is what it is all about. Humans have changed the balance of the earth’s atmosphere, and we will need to address this issue or the natural course of events will prevail. Pierre meditated and I sat behind my camera. Jim, Kurt, Juan, David, and Alan went to work helping to chop, load and carry ice blocks out of the auxiliary room in the ice core pit. The auxiliary room was too shallow to accommodate all of the ice cores that would be stored for the duration of the drilling. Snow is gathered in a crate outside of the Dome and melted to provide water for the kitchen and bathroom. Jim works out by shoveling snow for the snow crate. 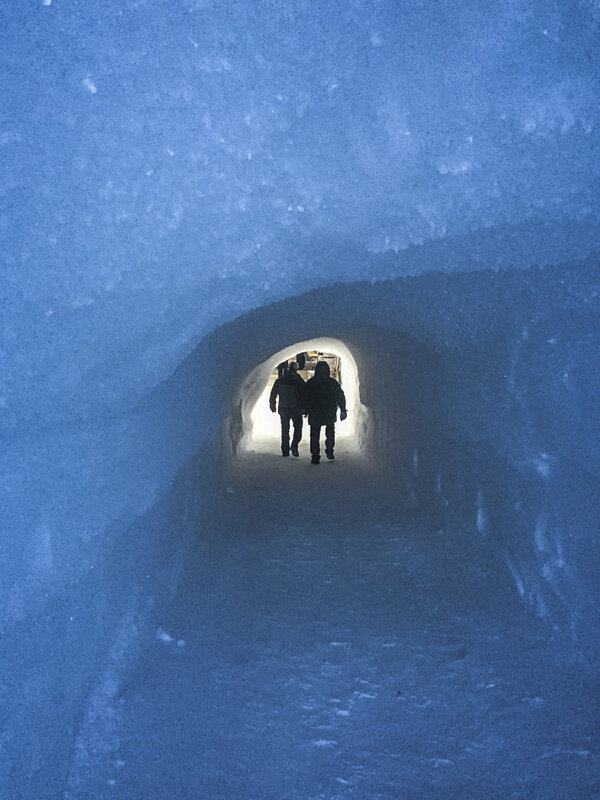 Juan and I revisited the snow pit one last time in order to relax and enjoy the crystal beauty of the blue snow. Outside there was a simple bamboo pole that had accumulated pristine snowflakes. We reconvened in the Dome to discuss world events with Alan. After lunch, David helped in the kitchen making perfect Chocolate Chip cookies. He later chopped garlic and peeled tomatoes for our evening dinner. Some of us went back into the ice pit to watch more ice core drilling. Mika cut a piece of the ice core for me so that I could see the tiny air bubbles that were trapped in the ice. Juan gave a PowerPoint recap of our 3 days at EGRIP, and what we needed to communicate about climate change to the public. 1. The increase in the amount of Greenhouses gasses in the atmosphere is heating our ocean. Air cools quicker than water, so we now have a built-in 13-meter rise in sea level through thermal expansion, the melting of the Greenland ice sheet, and the melting of mountain glaciers. 2. In the past 50 years, the average temperature of Greenland has risen 10 degrees C, which is the equivalent of changing the temperature of Copenhagen to the temperature of Gibraltar or changing the temperature of Minneapolis to Atlanta. The Arctic is melting twice as fast as the rest of the Earth. 3. The Arctic Sea Extent is diminishing. 4. Abrupt climate change is when the temperature increases 1 degree C per year over 5 years. This is 100 times faster than current global warming. 5. The rise in sea level will shift civilization. Florida is on porous soil and will not be able to sustain a rise in sea level. We finished a bottle of wine, talked until late, packed and spent our last night in our sleeping bags trying to digest all of the information that we had acquired at EGRIP. After breakfast, we gathered our luggage and waited for the C-130 Hercules to transport us back to Kangerlussuaq. 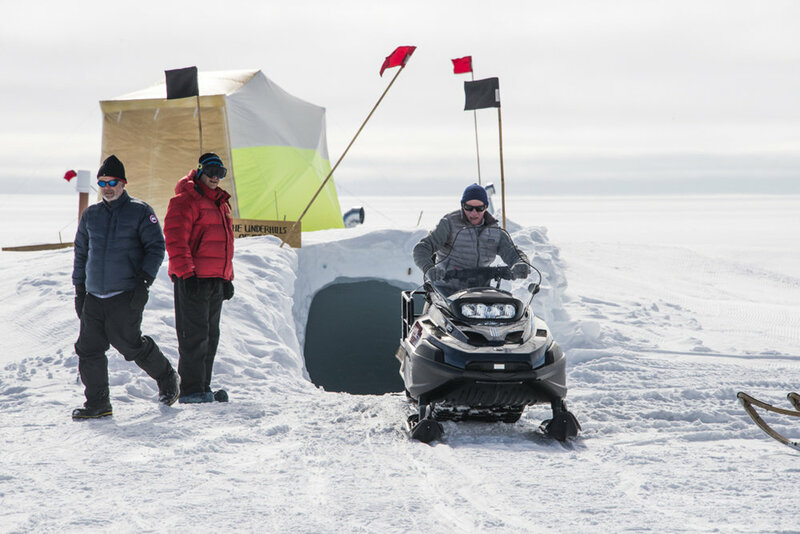 The C-130 would bring new visitors from The Alfred Wegener Institute and the University of Copenhagen to EGRIP for a brief tour of the camp and ice core drilling operations. Diana Vladimirova (surface scientist) and Chris Jacobs (mechanic who did the traverse from NGRIP to EGRIP on May 11th) were leaving EGRIP on this flight and their replacements were arriving. At 1:00PM, we said our good-byes and boarded the plane. A thin section of glacier ice placed between two crossed polarizers. On the flight back, I met Professor Frank Wilhelms from the Alfred Wegener Institute - an ice core expert that maps the crystal grains in sections of glacial ice. The crystal structure contains data on how ice deforms when exposed to stresses, thus revealing the flow history of the ice. Another fascinating study inside of the ice core! Most of the people on the flight back to Kangerlussuaq had never been to Ilulissat. 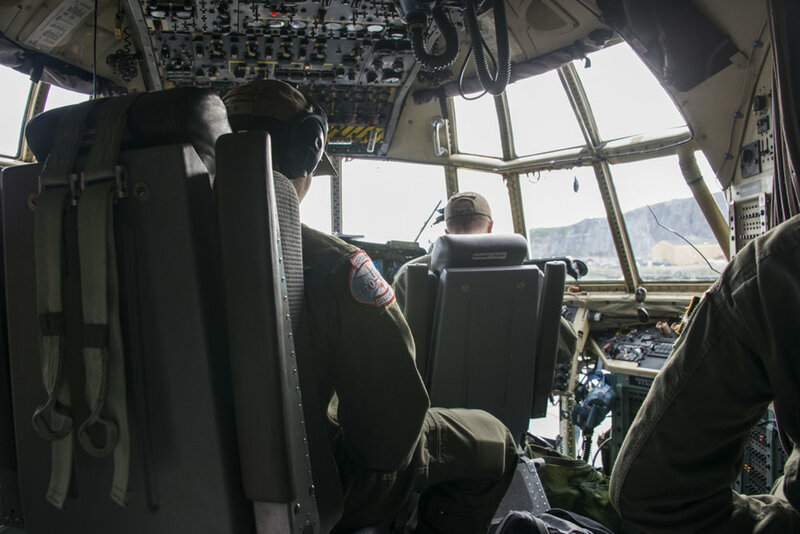 As a result, our pilots decided to take the C-130 on a one-hour detour to give all of those aboard an aerial tour of the Jakobshavn Glacier, Disko Bay and Ilulissat areas. 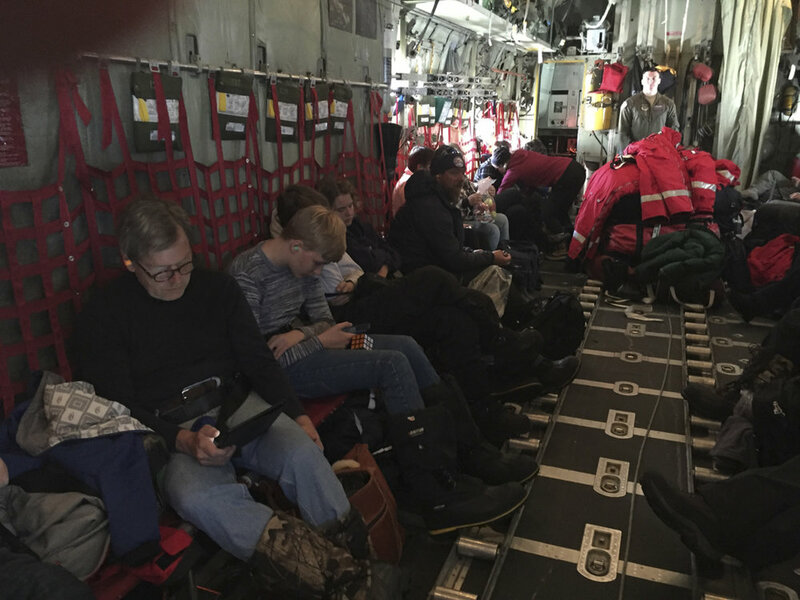 Everyone was glued to the small round windows on the sides of the Hercules to get a glimpse of the scenery below. It is very unusual to have such a large aircraft traveling over this delicate environment. We flew over the Jakobshavn Glacier, where the inlet was filled with small pieces of calved ice and icebergs spilling into Disko Bay. Continuing our flight over Disko Bay, we headed southeast to Kangerlussuaq. During my four-hour flight back to New York, my thoughts reflected on the Greenland landscape of 2016. This was my third trip to Greenland. How could I explain the visible transformation that the landscape had undergone since 2007? I have studied charts and read the statistics about the increase in greenhouse gasses. I have listened to scientists speak about data that maps past atmospheres, temperatures, and sea level within ice cores. I have also read and listened to information on the rapid melt of Greenland’s ice sheet. The Greenland ice sheet near Ilulissat in 2007 was covered with white fluffy snow. Now the snow is intermingled with silt leached from the bedrock below. The same area in Greenland’s ice sheet had very few meltwater areas in 2007 - now, it is covered with meltwater lakes feeding into deeper moulins. There were fewer icebergs in Disko Bay in 2007, but at that point they were much larger. 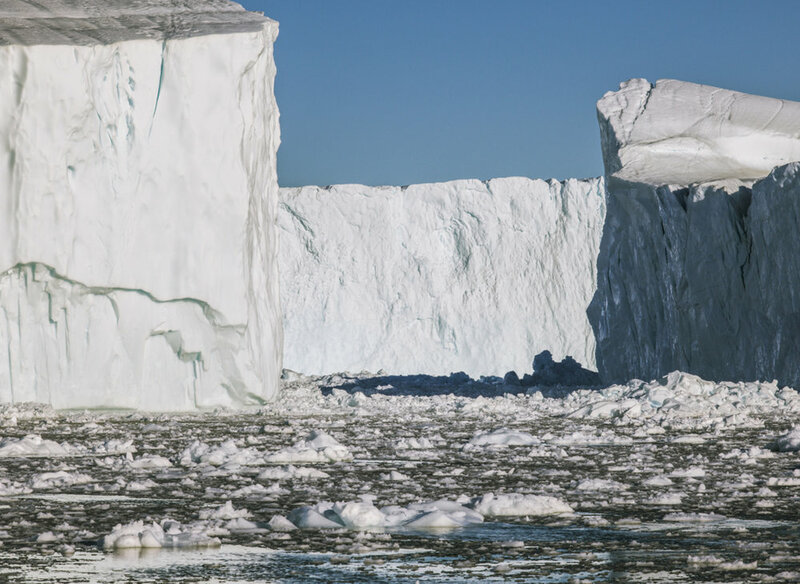 Today, Disko Bay is filled with hundreds of small icebergs. The temperature in August of 2007 was 32 degrees F. On July 16, 2016, the temperature was 65 degrees F.
My next monograph and exhibition, The Arctic Melt, will feature this fragile and disappearing Arctic landscape. Also featured will be imagery from my trip to the Arctic in June of 2015, where I observed the melt in Svalbard, Norway and journeyed to the North Pole on a Russian Nuclear Icebreaker. For upcoming news, please subscribe to my mailing list. All content © 1998-2018 Diane Tuft. All rights reserved.